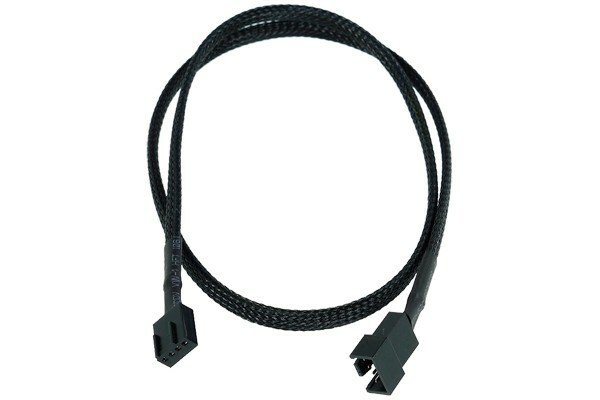 Extension cable for a PWM device (4-Pin). As controlling and switching of a PWM fan via the Mainboard is much more affordable than using a fan controller, this cable is perfect for any system with PWM fans! Black sleeve makes for a high-end and high-class finish of this cable. But the surrounding sleeve does not add to the looks of the cable, it also protects from abrasion and wear, increasing the lifespan of this cable significantly. The ends of the sleeve are covered and fixated with heatshrink tubing, creating a clean transition. Please note the difference between a 4-Pin power connector (Molex) and a 4-Pin fan connector (PWM).